Let me start by saying that I’m not the biggest fan of commercial holidays. First, New Years Eve, mainly because of the pressure people put on themselves to “have fun”. The best NYE celebrations I’ve had have involved spending time with friends and family, over a nice home cooked meal and celebratory midnight countdown and champagne. No fuss, no tickets to buy, no reservations to make, and no ridiculous line ups and crowds to contend with. I’ve always been a home body that way. As for Valentine’s Day, there are a few reasons why this holiday is on my not so nice list. No I’m not single and no I don’t hate romance. I’m happily married to a man I adore and I love romantic gestures, surprises and flowers. It’s just that I’d much prefer to be romanced, surprised and showered with flowers (and gifts, ahem) on any ordinary day of the year rather than Valentine’s day. The idea that you need a special day to celebrate love and romance doesn’t feel right to me, not to mention the pressure it puts on couples to make grand gestures. To be completely honest though, Hubby and I aren’t entirely against Valentine’s day. We fall victim to it as well and usually end up getting each other a small gift or flowers, but we both agree that we refuse to let the day take over and we refuse to be pressured into grand gestures for the sake of a commercial holiday. That said, I couldn’t let chocolate day, errr I mean Valentine’s day pass without sharing these Raspberry Cream Filled Chocolates with you. 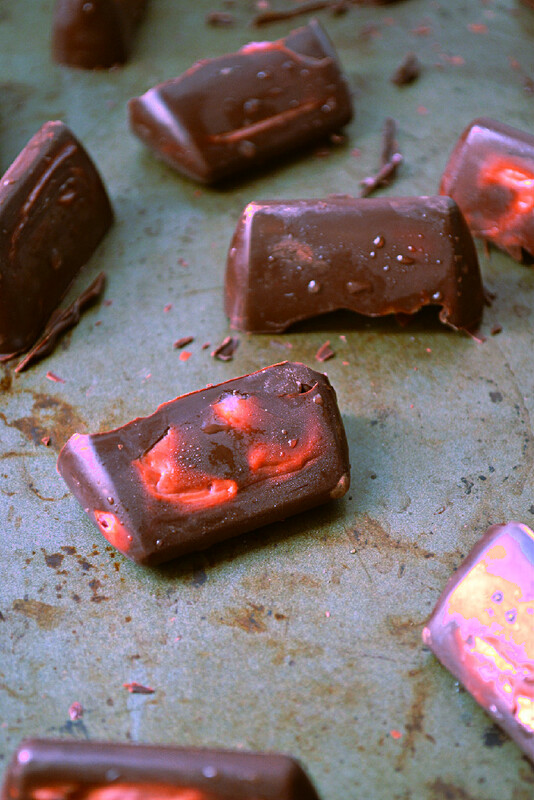 Not that you should limit yourself to Valentine’s day to make them and enjoy them, but it seemed like the perfect excuse and time to share such a recipe, since everyone’s on high alert for chocolate and pink. The filling is made with raw cashews, lemon, vanilla, coconut and brown rice malt syrup and gets it’s bright pink colour and slight tart flavour from fresh raspberries. Making them is a bit of a process, but don’t let the multiple steps scare you off, as they’re totally worth it. You can store them in the freezer and have them as a frozen treat or leave them in the fridge and enjoy them like a chocolate covered cream. But don’t leave them at room temperature. 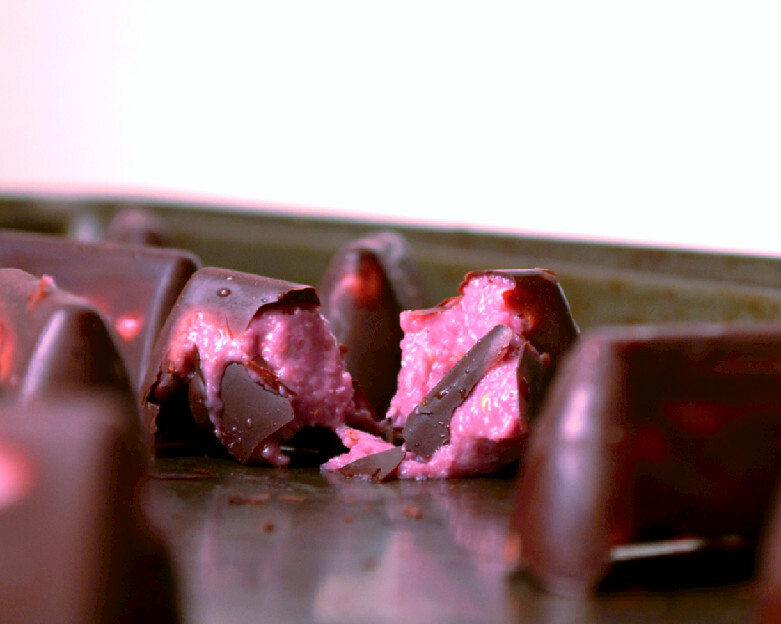 Whether or not you celebrate, love or loath Valentine’s day, whether you’re single, dating or married, I guarantee you will enjoy these dark chocolate coated raspberry and cashew cream treats. So, what are you waiting for, go soak some cashews and get to it! Then take a picture of your creation and tag #harmonyalacarte on Instagram so I can see it. 200 gr Dark Chocolate (I used 2 1/2 bars of Vivani 92% Dark Chocolate which is sweetened with coconut sugar). Combine all filling ingredients in a food processor or high speed blender and puree until smooth. Set aside. Melt half the chocolate, using a double boiler method, by placing a heat resistant bowl over a pot of boiling water and using the bowl to melt the chocolate. Coat the bottom and sides of a silicone chocolate mold with the melted chocolate, as evenly as possible. It’s ok if it’s not perfect, they’ll just come out rustic looking like mine did, with the raspberry cream peaking through. I kind of like the homemade appeal. Place mold in the freezer for about 10 minutes until the chocolate is solid. 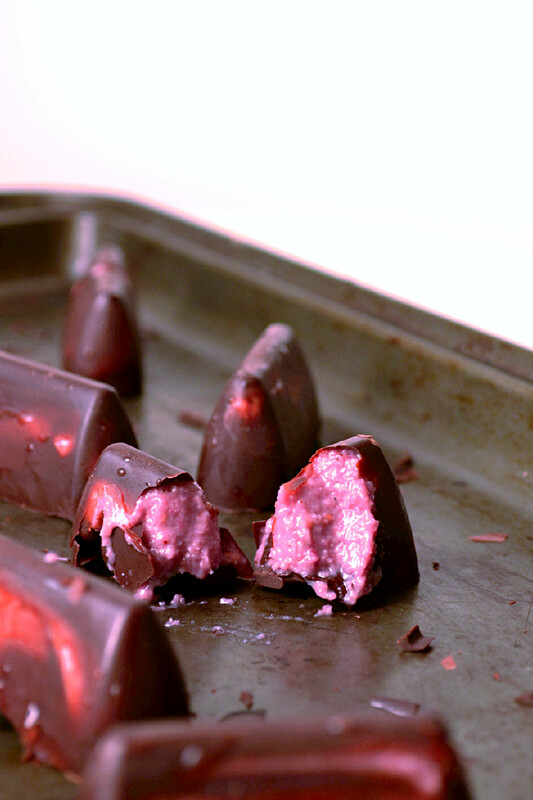 Remove the molds from the freezer, fill them with the raspberry cashew cream, about 3/4 full, leaving room for more chocolate at the top, and return them to the freezer for about 1 hour, until the filling has firmed up a bit. Remove them from the freezer, melt the remaining half of the chocolate, using the double boiler method once again, and drizzle it over the filling, as uniformly as possible so you don’t end up with jagged bottoms (once again, no biggie if you do, it happens as you can see from the pictures). The cold filling will start to solidify the warm chocolate on contact, so be sure to work quickly. Return the molds to the freezer and let them solidify completely for at least 4 hours or better yet over night before removing them from the molds. If you try to remove them too early, the chocolate will crack, so it’s worth waiting. Store them in an airtight container, in the fridge or freezer and enjoy whenever you feel like having a sweet chocolaty treat. Pure Bourbon Vanilla Powder.. Would it be ok to just leave it out or Is there something else I could use? Hi Julia, you could try some vanilla extract if you have that or just leave it out. Enjoy.